One in seven people in the world is food insecure. The numbers in the U.S. are the same except for children. Those are worse: one in five. 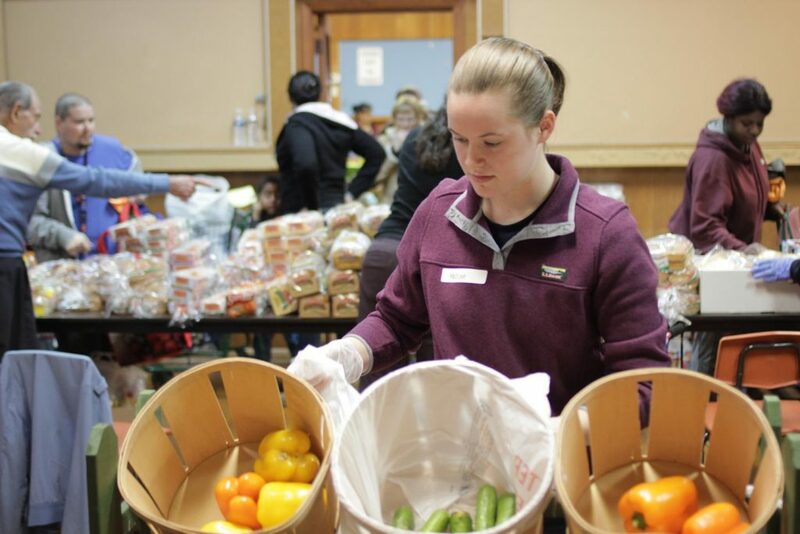 Eleven pantries in Easton distribute food to those in need. With 32 percent of households below the federal poverty line, it is no surprise that nearly 52 percent, or 4,625 students, receive federally supported meals (free lunch) at area schools. Such numbers might surprise locals as they fail to recognize hunger in their neighbors. This data from Easton Hunger Coalition drives its mission: to eliminate hunger, provide a forum to plan interventions, and serve as a catalyst for program implementation. See the bottom of the article for information on Hunger and Homelessness Awareness Week events at Lafayette. Taking this mission to heart is Ryana Jones ’20. On a rainy night in Easton’s West Ward, the upper floors of St. Anthony’s Church are bustling. St. Vincent de Paul Society runs its pantry there on the first and third Tuesdays of the month. Twenty-five volunteers help operate four rooms—medical, clothing, food, and non-perishables. Among those volunteers is Jones and the five students she coordinates for this part of her program. Stationed at tables around the room, each student helps people in need. As a choice pantry, they allow guests to select items they want and need based on their household size. Some students offer limes, bananas, pears, apples, peppers, and potatoes while others help bag and carry out groceries. The guests chat and laugh with the volunteers as they shop. Jones is the face guests see at the end of their visit as she consolidates items into bags and boxes. Hailing from New Haven, Conn., Jones understands difficult circumstances. “My community struggles with poverty and the lack of opportunity,” she says. In seventh grade, she began to intervene in those struggles by volunteering in a soup kitchen, but her volunteer service truly started at a local nursing home at age eight. Her belief in service has only grown. During her first semester on campus, she dove in, volunteering as a tutor for America Reads, which she has maintained for three years. Add to it her work at Easton Area High School as part of Generation Next, which assists juniors and seniors with the college-application process. But she wanted more. 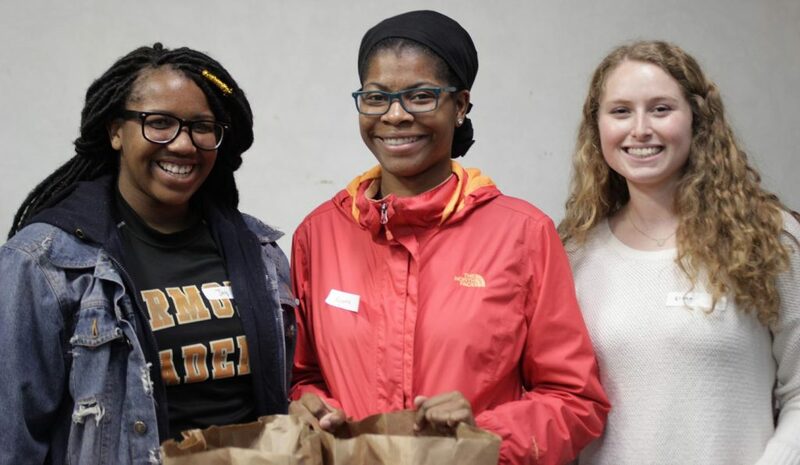 As program coordinator for the Hunger Coalition, she recruits students, meets community partners, provides education and training, and manages schedules for multiple pantries in Easton. While she distributes items at St. Vincent de Paul, she helps stock and organize them in the pantry at ProJeCt of Easton. The government & law and women’s & gender studies double major hopes one day to open a resource center that will help her community in a holistic manner. Landis Center for Community Engagement has helped her refine her growing appetite for social change. It encouraged her to become a coordinator and dive into Easton. That made all the difference. Her fellow students at St. Vincent de Paul agree. 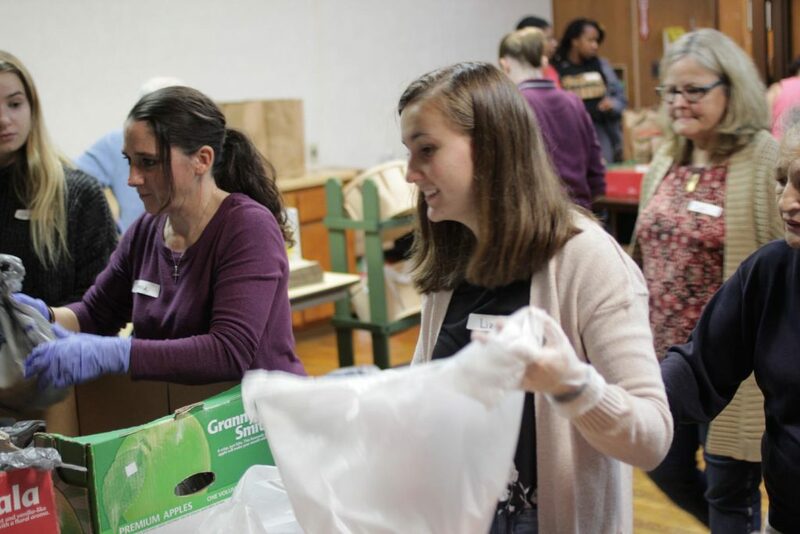 It’s that attitude that has helped Nancy Walters, manager of Easton Hunger Network, maintain a growing file of college volunteers. 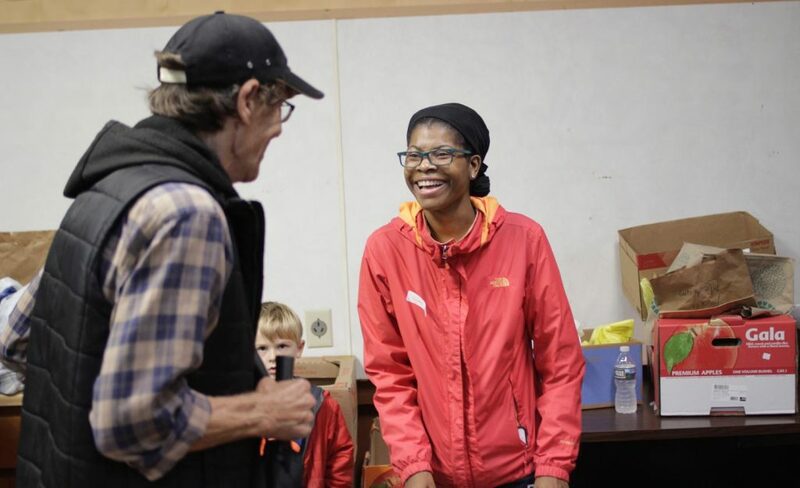 “They are excellent helpers and find ways to connect current leaders with future leaders so our programs and partnership can continue to thrive,” says Walters. Jones is eager to get her fellow students off College Hill. As a part of Hunger and Homelessness Awareness Week, Lafayette Landis Center for Community Engagement and Brothers of Lafayette are collecting high-priority food items all week. 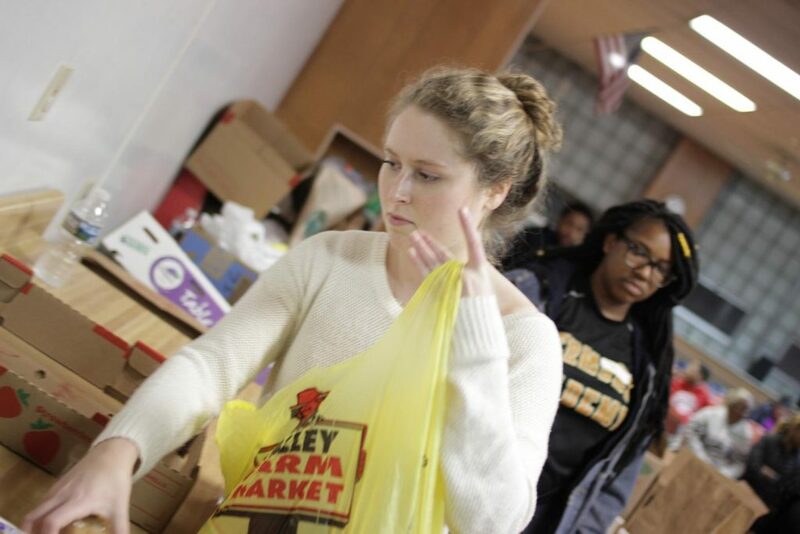 Boxes will be placed in Marquis Hall (residence hall and Clay Ketchum dining room), Farinon Center, Portlock Black Cultural Center, Pardee Hall, Kirby Sports Center, and the Landis Center (Farinon room 120). Donations are made easy if you stop by Lower Farinon or Marquis and purchase a bag full of priority food items for $5 flex, or Venmo @LandisFoodDrive. Need to Feed: Monday, 11:30 a.m.-1 p.m., Fairnon Atrium. Make two peanut butter and jelly sandwiches. One is for you; the other will be delivered to Easton’s homeless shelters and food pantries. Local Voices in Public Education: Tuesday, noon, Oechsle Hall (psychology/neuroscience) room 224. Join Hector Bonilla, principal of Tracy Elementary School, and Carolyn Serva, executive director at Family Connection, as they discuss how Hunger and Homelessness affect the experience of local children in the public education system. Pizza lunch is provided. When Helping Hurts: Tuesday, 6 p.m., Kirby Hall of Civil Rights auditorium (room 104). Guillermo Lopez will discuss the concept of white saviorism, empathy, classism, and challenging bias in programs that seek active citizenship among communities of need. Education and Action: How a College Student Can Make a Difference: Thursday, 6 p.m., Kirby Hall of Civil Rights auditorium (room 104). Activists from the community and Easton Hunger Coalition will share their knowledge and experience as well as provide insight into potential solutions to the issues of hunger, food insecurity, and homelessness. Dinner will be provided.